Nature and architecture converge in breathtaking fashion at this cliffside residence in Calpe (Alicante), Spain. Designed by the Valencia-based firm Fran Silvestre Arquitectos, the stucco-clad home features living spaces projected above the steep terrain, with a crisp exterior staircase linking them to the minimalist pool terrace below. If architecture is experienced as a series of moments, what could be more invigorating than the instant of emerging from a dip in this extraordinary setting? ...continue reading "Architecture in Spain: Cliffside House in Calpe, Alicante"
Gamesa is a multinational company engaged in the manufacture and maintenance of wind turbines for green energy production. The building is situated in a micro-suburban landscape into a business park. 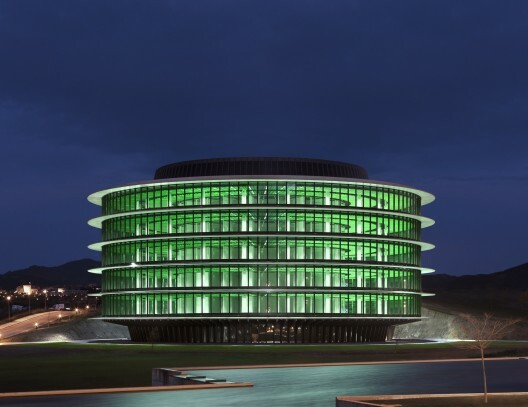 This technology park, located in Pamplona (Navarra), is characterized by an implantation of buildings in isolation, in a green environment. Surrounded by road links, the project responds as a great infraestructural milestone, as a large transparent tank. An autonomous geometry floating on a green hillside. -The visibility and positioning of the building. - Interior nighttime lighting for safety. - Transparency of the facade and interior-exterior bidirectional visibility. - And, very important, reducing energy consumption of all facilities. ...continue reading "Sustainable Building in Pamplona, Navarra, by Vaillo-Irigaray"
Cloud 9 won the top price at the World Architecture Festival 2011 with their Media-ICT office building for Barcelona’s new 22@ district.The Barcelona-based architecture office Cloud 9 Architects won the award World Building of the Year 2011 at the World Architecture Festival in Barcelona, Spain, with their Media-ICT office building. 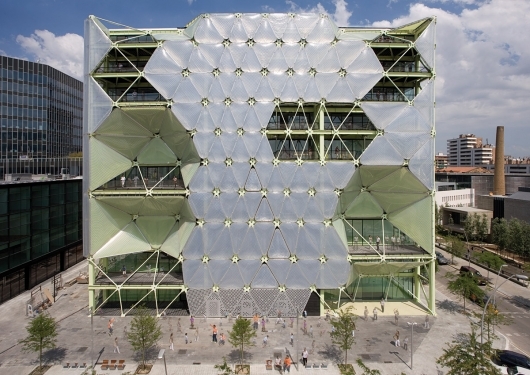 The façade facing south is made of inflatable ETFE cushions that act as a variable sunscreen – opening in winter to gain solar energy, and closing in summer to protect and shade. At the southwest façade Nitrogen-based fog is introduced in these cushions to increase their opacity and thus to screen off the building’s users. 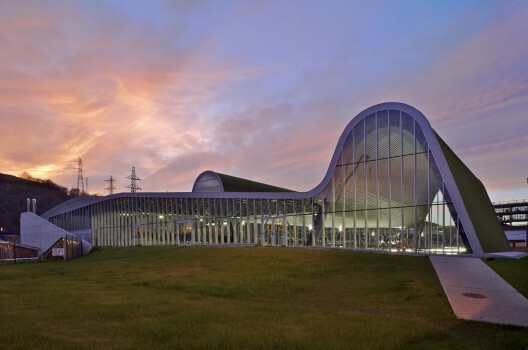 The photovoltaic roof, the use of District Cooling and smart sensors are additional features that allow optimize energy use within the Media-ICT building. ...continue reading "Media-ICT office building in Barcelona designed by Cloud 9"
If you are planning to build a spacious house on a narrow piece of land, you can get inspired by the Step House creation at the Spanish city of Girona. This brilliant architecture emerges from the thoughts of Catalonian Spanish architects who are part of 05 AM Arquitectura. The house is chic with unconventional styling employed so as to augment the lighting and spaces of the rooms. The home has been made to align with the north or the south elements and brings in abundant natural light. The house has two main entrances at the first floor, ground entrance and the lower, ground garden level that also makes for car porch. A comfortable living room, compact kitchen and terrace are allocated in the main floor. Between the house basement and the main level, a unique space is crammed in as a transitional level that can be best used for leisure and study spaces. ...continue reading "Architecture in Spain: Modern House in Girona"